Note the double impedance compensation on the tweeter side. 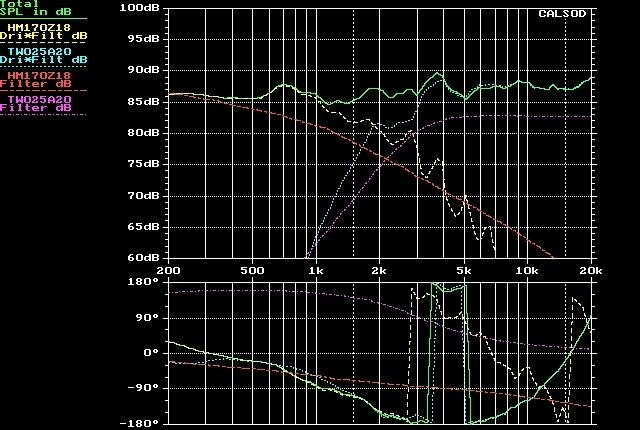 Green curve stands for the total speaker SPL response while yellow and blue for the drivers responses alone. Red and pink curves describe the filters' gain responses. However good this design seems to be we can't tolerate the fact that crossover frequency is too low, only 2100 to 2200Hz. The tweeter's thermal endurance is generally questionable at high power levels when crossover frequency becomes lower than 2.5kHz. Classical music is not expected to drive tweeter's temperature beyond the limit but who can promise that it will be the only kind of music our speaker will have to reproduce. 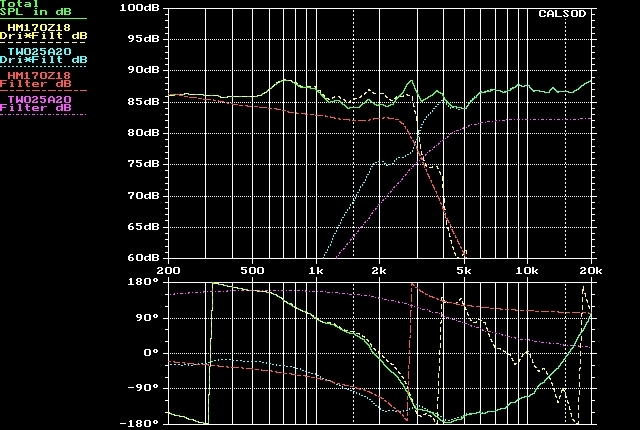 In such a general discussion over the thermal dissipation limits of tweeters we refer to power levels that may induce distortion but will not burn the woofer driver. At such power levels we want the tweeter driver not to be destroyed too. Thus we generally seek crossover frequencies above 2.5kHz. To implement this rule to this speaker project we try to shift crossover frequency to the right at 3000Hz approximately. Whatever the changes we make to our lowpass filter we realize that we can not have both the mild 500Hz and a steep rolloff above 2000Hz. We increase the order of our lowpass filter (now 3rd order) by adding a series inductor (L3) just before the woofer driver and its impedance compensation subcircuit. 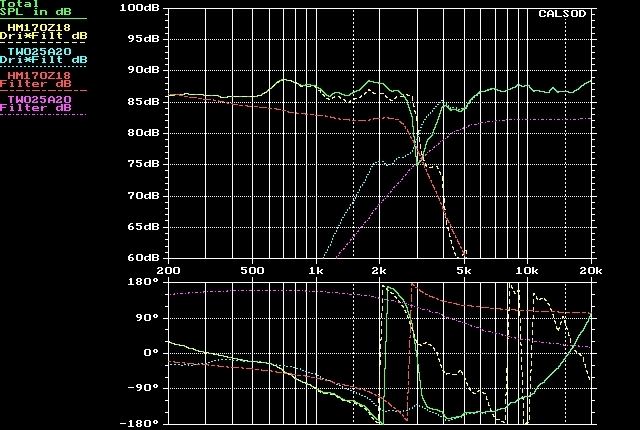 Of course one could proceed to further adjustments that would trim the 2900Hz peak and re-position (ie. 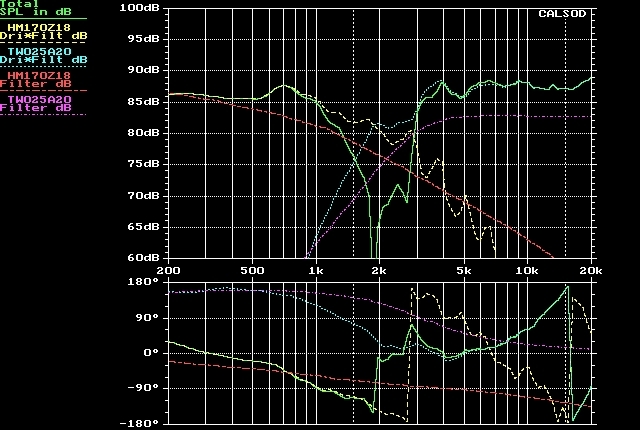 move upwards or downwards) the mid and high SPL levels with respect to low frequency level of 86dB. Below 200Hz our simulation software simply uses woofer impedance measurements which reflect enclosure and vent resonances : our lowpass filter components are transparent and the highpass filter behaves as a very high resistance ie as a switched off circuit. At high frequencies the lowpass filter switches off introducing very high resistance with L1 and L3 inductors while the highpass filter becomes transparent: now the speaker's impedance equals that of the tweeter driver as compensated by the relative subcircuits we designed. Around the crossover frequency range we observe a 'hill' shaped area. It is formed by the parallel combination of the filters' impedances. At the left side of the 'hill' we have the lowpass filter starting to switch off (impedance increasing) and the highpass filter almost completely switched off (infinite impedance). 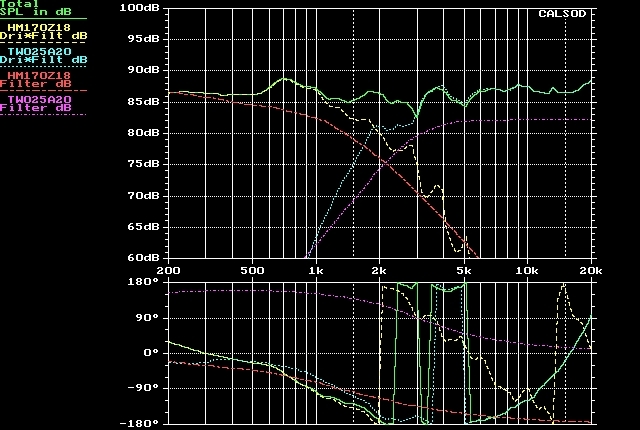 At the right side of the 'hill' we have the lowpass filter almost completely switched off (infinite impedance) and the highpass filter just starting to switch on (impedance decreasing). In 8 ohms speaker systems we want the impedance plot above 200Hz not to have strong peaks and dips above 16 ohms and below 5 ohms. 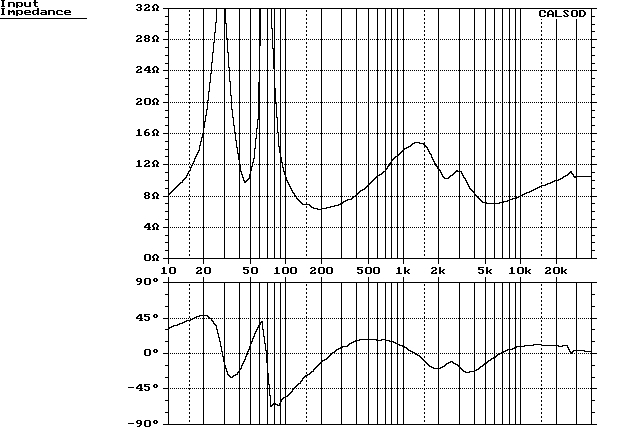 Impedance phase (above 200Hz) is a reliable indication of our speaker's inductive or capacitive nature. Amplifiers love driving as resistive as possible speaker loads. Especially cheap amplifiers! This is an extra issue to consider in crossover design. Anyway, impedance phase should swing (above 200Hz) not outside the +/-30 degrees zone.